The goslings are about 2/3'rds grown already. I remember when one of them would fit in the palm of my hand. Barely five weeks later, they're almost the size of our two-year olds! As you might guess, Tufted Roman Geese have been breed to mature quickly. Small as this breed may be (10 to 12 pounds max), they're considered meat birds. 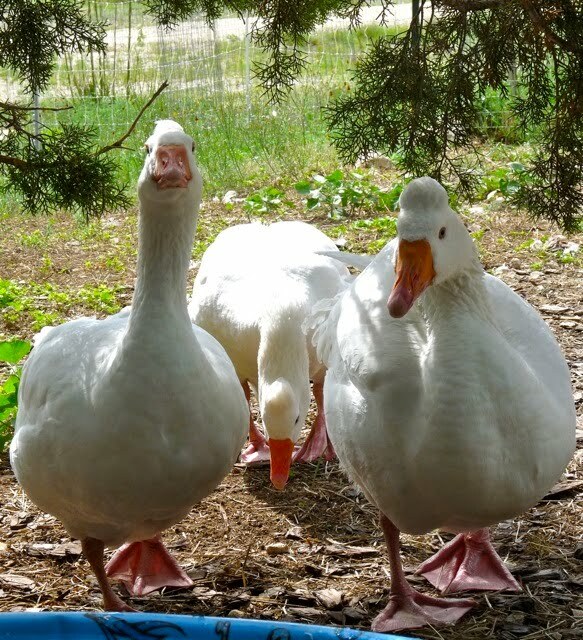 Although we bought them as "guard geese" and think of them as pets, there's been times when thoroughly annoyed by their antics I've thought of them as "meat birds" as well... but I digress. Ahem! Anyhow, I've been trying to integrate the goslings with the mature geese for three days now. A few hours at a time these past few early evenings. Nothing doing. 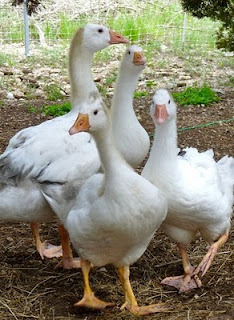 The mature geese see the new girls as interlopers, and run the goslings all over the pen. Once in awhile the group of young'uns will charge back, frightening a solitary goose, but then the older geese will group up and charge back. There's only the occasional chomp on a wing, otherwise it's mostly posturing and bluff. 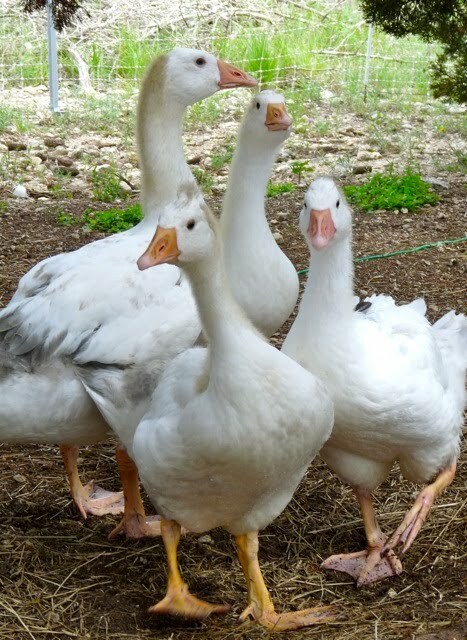 Maybe once the goslings get a little older, Billy-Bob will realize these are new females for his harem and broker some sort of peace agreement. As I look out the window right now, there seems to be a cease-fire of sorts: the mature geese are on one side of the pen, resting, and the goslings on the other side, doing the same. Perhaps from this will come a détente, then a relative peace - as far as "peace" and "geese" go. I certainly hope so!